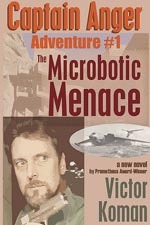 Captain Anger Adventure #1: The Microbotic Menace is the very first in a series of exciting, fast-reading novels for all ages. Working in secrecy at the Anger Institute, Cap and his six fellow adventurers monitor the planet for the next madman bent on world conquest. This time, a crazed scientist unleashes the ultimate terror: microscopic robots programmed for destruction. As Captain Richard Anger races to find a cure for the silver-liquid death, he pilots his sea-going superjet to a mysterious island of strange metallic mountains and steel-clad shores. There he and his hard-fighting companions — Rock, Leila, Tex, and Sun Ra — must use their wits and the weapons of super-science to stop the mad genius Dandridge before he tears the earth apart. Writing in the style that set the rules for the New Heroic school, three-time Prometheus Award winner Victor Koman has created a warrior against evil for the new millennium: Captain Anger!